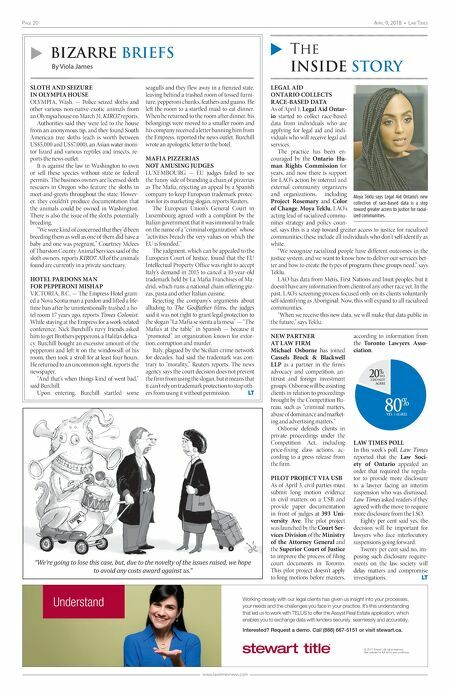 Page 20 April 9, 2018 • lAw Times www.lawtimesnews.com u Bizarre Briefs By Viola James u The InsIde story "We're going to lose this case, but, due to the novelty of the issues raised, we hope to avoid any costs award against us." SLOTH AND SEIZURE IN OLYMPIA HOUSE OLYMPIA, Wash. — Police seized sloths and other various non-native exotic animals from an Olympia house on March 31, KIRO7 reports. Authorities said they were led to the house from an anonymous tip, and they found South American tree sloths (each is worth between US$5,000 and US$7,000), an Asian water moni- tor lizard and various reptiles and insects, re- ports the news outlet. It is against the law in Washington to own or sell these species without state or federal permits. The business owners are licensed sloth rescuers in Oregon who feature the sloths in meet-and-greets throughout the state. Howev- er, they couldn't produce documentation that the animals could be owned in Washington. There is also the issue of the sloths potentially breeding. "We were kind of concerned that they'd been breeding them as well as one of them did have a baby and one was pregnant," Courtney Mclees of Thurston County Animal Services said of the sloth owners, reports KIRO7. All of the animals found are currently in a private sanctuary. HOTEL PARDONS MAN FOR PEPPERONI MISHAP VICTORIA, B.C. — The Empress Hotel grant- ed a Nova Scotia man a pardon and lifted a life- time ban after he unintentionally trashed a ho- tel room 17 years ago, reports Times Colonist. While staying at the Empress for a work-related conference, Nick Burchill's navy friends asked him to get Brothers pepperoni, a Halifax delica- cy. Burchill bought an excessive amount of the pepperoni and left it on the windowsill of his room, then took a stroll for at least four hours. He returned to an uncommon sight, reports the newspaper. "And that's when things kind of went bad," said Burchill. Upon entering, Burchill startled some seagulls and they f lew away in a frenzied state, leaving behind a trashed room of tossed furni- ture, pepperoni chunks, feathers and guano. He left the room to a startled maid to eat dinner. When he returned to the room after dinner, his belongings were moved to a smaller room and his company received a letter banning him from the Empress, reported the news outlet. Burchill wrote an apologetic letter to the hotel. MAFIA PIZZERIAS NOT AMUSING JUDGES LUXEMBOURG — EU judges failed to see the funny side of branding a chain of pizzerias as The Mafia, rejecting an appeal by a Spanish company to keep European trademark protec- tion for its marketing slogan, reports Reuters. The European Union's General Court in Luxembourg agreed with a complaint by the Italian government that it was immoral to trade on the name of a "criminal organization" whose "activities breach the very values on which the EU is founded." The judgment, which can be appealed to the European Court of Justice, found that the EU Intellectual Property Office was right to accept Italy's demand in 2015 to cancel a 10-year-old trademark held by La Mafia Franchises of Ma- drid, which runs a national chain offering piz- zas, pasta and other Italian cuisine. Rejecting the company's arguments about alluding to The Godfather films, the judges said it was not right to grant legal protection to the slogan "La Mafia se sienta a la mesa" — "The Mafia's at the table" in Spanish — because it "promoted" an organization known for extor- tion, corruption and murder. Italy, plagued by the Sicilian crime network for decades, had said the trademark was con- trary to "morality," Reuters reports. The news agency says the court decision does not prevent the firm from using the slogan, but it means that it can't rely on trademark protection to stop oth- ers from using it without permission. LT LEGAL AID ONTARIO COLLECTS RACE-BASED DATA As of April 1, Legal Aid Ontar- io started to collect race-based data from individuals who are applying for legal aid and indi- viduals who will receive legal aid services. The practice has been en- couraged by the Ontario Hu- man Rights Commission for years, and now there is support for LAO's action by internal and external community organizers and organizations, including Project Rosemary and Color of Change. Moya Teklu, LAO's acting lead of racialized commu- nities strategy and policy coun- sel, says this is a step toward greater access to justice for racialized communities; these include all individuals who don't self-identify as white. "We recognize racialized people have different outcomes in the justice system, and we want to know how to deliver our services bet- ter and how to create the types of programs these groups need," says Teklu. LAO has data from Métis, First Nations and Inuit peoples, but it doesn't have any information from clients of any other race yet. In the past, LAO's screening process focused only on its clients voluntarily self-identifying as Aboriginal. Now, this will expand to all racialized communities. "When we receive this new data, we will make that data public in the future," says Teklu. NEW PARTNER AT LAW FIRM Michael Osborne has joined Cassels Brock & Blackwell LLP as a partner in the firm's advocacy and competition, an- titrust and foreign investment groups. Osborne will be assisting clients in relation to proceedings brought by the Competition Bu- reau, such as "criminal matters, abuse of dominance and market- ing and advertising matters." Osborne defends clients in private proceedings under the Competition Act, including price-fixing class actions, ac- cording to a press release from the firm. PILOT PROJECT VIA USB As of April 3, civil parties must submit long motion evidence in civil matters on a USB and provide paper documentation in front of judges at 393 Uni- versity Ave. The pilot project was launched by the Court Ser- vices Division of the Ministry of the Attorney General and the Superior Court of Justice to improve the process of filing court documents in Toronto. This pilot project doesn't apply to long motions before masters, according to information from the Toronto Lawyers Asso- ciation. 20 % NO, I DO NOT AGREE YES, I AGREE 80 % LAW TIMES POLL In this week's poll, Law Times reported that the Law Soci- ety of Ontario appealed an order that required the regula- tor to provide more disclosure to a lawyer facing an interim suspension who was dismissed. Law Times asked readers if they agreed with the move to require more disclosure from the LSO. Eighty per cent said yes, the decision will be important for lawyers who face interlocutory suspensions going forward. Twenty per cent said no, im- posing such disclosure require- ments on the law society will delay matters and compromise investigations. LT Understand © 2017 Stewart. All rights reserved. See policies for full terms and conditions. Working closely with our legal clients has given us insight into your processes, your needs and the challenges you face in your practice. It's this understanding that led us to work with TELUS to offer the Assyst Real Estate application, which enables you to exchange data with lenders securely, seamlessly and accurately. Interested? Request a demo. Call (888) 667-5151 or visit stewart.ca. Untitled-6 1 2018-04-03 1:41 PM Moya Teklu says Legal Aid Ontario's new collection of race-based data is a step toward greater access to justice for racial- ized communities.